Sometimes your handstand training buddy stands you up. Sometimes you’re the only one at your gym or studio who’s excited about standing on your hands. No matter the reason, training handstands by yourself can feel lonely, impossible, or both — but there are ways to do it successfully and keep the joy alive! Years ago, on a trip to San Francisco, the Chinese acrobatics master Lu Yi told me that the first thing one must train in handstands is strength (next, balance; then, simple tricks; then, harder tricks; finally, creativity). While I don’t agree that creativity has to come last, it does seem that one basic way to train handstands on your own is to build strength by holding them for as long as you possibly can — a good goal for beginners and advanced practitioners alike (Lu Yi wants me to be able to balance a handstand for five minutes — “to be professional,” he says — so I should definitely be strong enough to stay in a handstand for that long without having to balance myself). It sure is nice to train endurance holds with someone spotting your handstand, but if you’re on your own, it’s time to get comfy in a handstand at the wall. You can handstand with your back or your belly to the wall. I think it’s good to do it both ways. Unfortunately, either way, your body won’t be completely stacked in vertical alignment; if it were, you’d pull away from the wall and balance without it. But you’ll still build useful handstand strength. 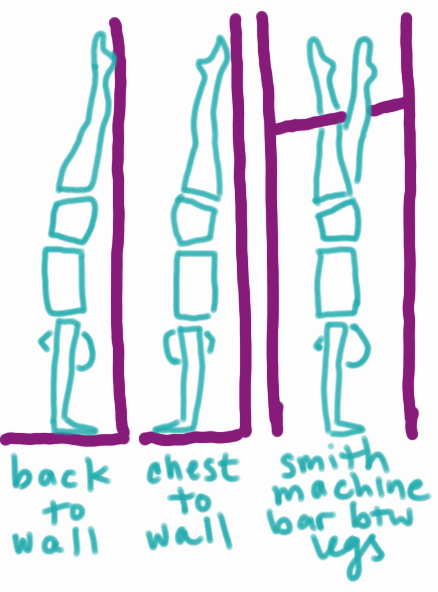 If you have access to a gym and can already kick up to a balanced handstand with control, you might be able to try a third possibility: set the bar of a Smith machine to somewhere around chin height, then kick up to a handstand in which you squeeze the bar between your legs to keep balanced. Three one-minute holds against the wall per training session might be a good starting place. If you can’t hold for a minute yet, find a time that’s challenging but achievable (even 15 seconds is a legit starting place). 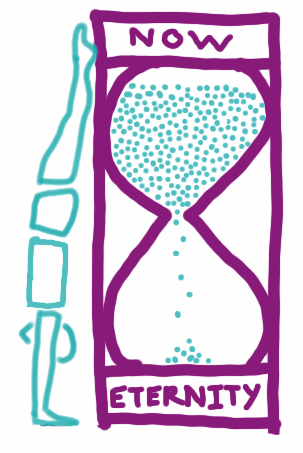 Whatever time you can hold now, increase it by a few seconds each week. Years ago, I made a handstand hold playlist: I sorted all my songs in iTunes by time, then selected ten songs I’d like to listen to in a handstand, according to length. The first song that I added to the playlist lasted two minutes. The next was 2:05, then 2:10, and so on up. Each week I tried to hold a handstand to the next longer song on the list. Three fixed-length holds are just one way to spend time against the wall. If you get burnt out, bored, or discouraged, don’t give up — try another structure instead! Choose a total amount of time you must spend in a handstand at the wall during a particular training session (3, 6, 10 minutes? ), and accumulate those minutes in as many segments as you need to, making each one as long as possible but not worrying if they get shorter and shorter as you work. Hold each wall handstand for a number of breaths rather than a number of seconds. Or try a ladder or pyramid counting breaths, from a 1-breath handstand to perhaps a 12-breath handstand. 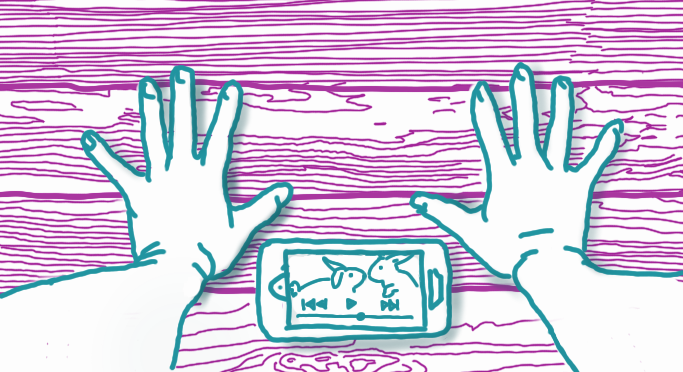 Save cute animal videos you come across on Facebook (or whatever videos you like to watch); place your phone on the floor between your hands and watch them only while upside down. Here’s a 0:37 one to get you started! To make your handstands at the wall harder (and/or shorter and/or more interesting), try wearing ankle weights during your holds. 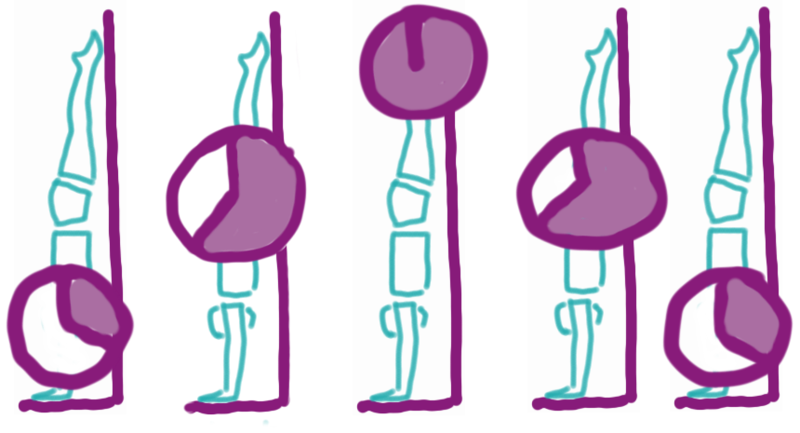 To detail the technique of doing handstands at the wall will require a separate post, but here are some quick thoughts. Place (or walk) your hands as close to the wall as possible while still staying stable and safe. Make sure your hands are directly under your shoulders, not wider, and that your fingers are spread out. Your middle fingers (or perhaps your index fingers; techniques vary) should be parallel to each other, pointing straight forward. Push your shoulders up toward your ears and squeeze your elbows in toward each other, locking them if possible (or not locking them, if they hyperextend dramatically). Squeeze your legs together, knees straight, ribs in, hips open, lower back long, tail tucked or reaching toward heels, ribs connected to hip bones, shoulders open, base of index fingers pressing down. (Read my recent blog post on handstand alignment here.) Meanwhile, find a way to breathe that works for you. The breathing will get easier. Endurance holds are only one way to build strength, and building strength is only one way to train handstands on your own (some other ways are even more fun!). Coming up, I’ll share more solo training ideas with you on topics including: strength parts 2 and 3 (shoulders and abs), balance, alignment, tuck-ups and straddle-ups, presses … and hopefully much, much more! But in the meantime … what methods have you used to train endurance holds, without a coach or training buddy present? How have you stayed motivated and kept your joy alive? I love these posts– thank you so much for sharing your wisdom and whimsical drawings! Thank you! I live in a remote area, with limited access to a gym, handbalancing or acro community. The motivation and learning comes from trial and error, limited exposure to play communities and posts like yours. Really appreciate your thorough (ad free!) posts! Bria, that’s so encouraging to hear! I’m glad I can help in some small way. Great advice; It sometimes can get boring. I’ve been a fan of yours ever since I saw a youtube video of you in connection with the Movement Project. I’ve had major problems training alone. Mostly because of my bad shoulder flexibility. Arched lower back, bent elbows and massive shoulder angle in chest to wall was a struggle because I didn’t know what to do and my mobility was poor. It still is poor but it’s getting better. Coming back to why I’m still motivated it’s because I want good alignment. Hopefully with time I get the alignment thing right. Maybe in the next 5 years or so. Love your blog, it’s amazing and thank you.